“It’s also lonely with people,” said the snake. The little prince looked at him for a long time. “You are a funny creature,” he said at last, “You’re no thicker than a finger. “But I’m more powerful than the finger of a king,” said the snake. “I can take you further than a ship,” the snake said. “I solve them all,” said the snake. And they were both silent. 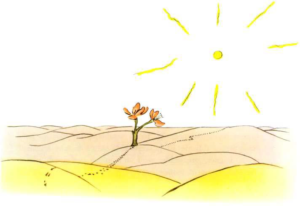 “Where are the people?” the little prince asked politely. The flower saw a caravan passing one day. 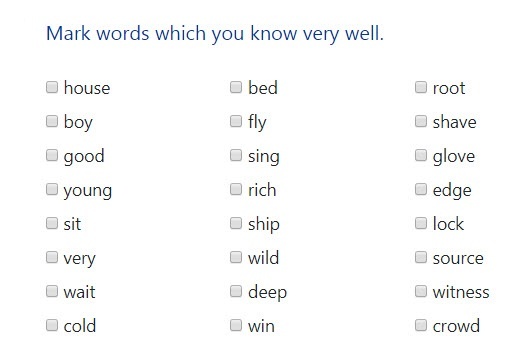 “People?” I believe there are six or seven of them. I saw them years ago. But you never know where to find them. The wind blows them away. They have no roots, and that makes their life very difficult. 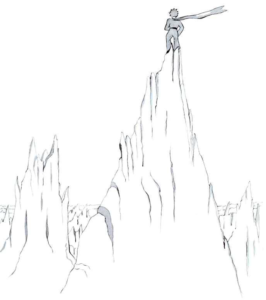 The little prince climbed a high mountain. The only mountains he knew were the three volcanoes which came up to his knees. But he only saw other mountains around. “Hello, hello, hello,” the echo answered. “Who are you?” asked the little prince. “Who are you? Who are you? Who are you?” the echo answered. “Let’s be friends, I am lonely,” he said. “I am lonely, I am lonely, I am lonely,” the echo answered. 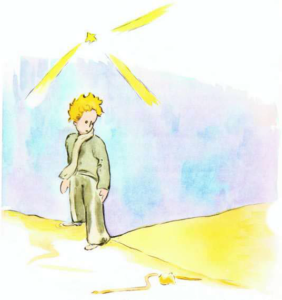 The little prince was walking for a long time through sand and rocks, and then he finally discovered a road. And all roads lead to people. “Good morning,” he said. He was standing before a garden full of roses. “Good morning,” said the roses. 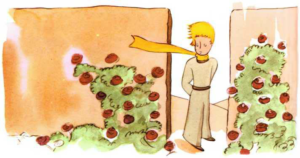 The little prince was examining them carefully. They all looked like his flower. “Who are you?” he asked, surprised. “We are roses,” the roses said. “Ah!” said the little prince. And he felt very unhappy. His flower told him that she was the only one of her kind in the whole universe. And here were five thousand of them, all very similar, in just one garden! And I would have to pretend to look after her, because otherwise she would really let herself die to humiliate me. Then he said to himself, “I thought I was rich because I had this one unique flower, and all I had was an ordinary rose. And, he lay down in the grass and he was very sad.